Armenian wooden door with cross and stylized wings, and a royal hunt scene with a leopard behind the king, probably from Cilicia, 12th or 13th century. probably from Cilicia, 12th or 13th century. A larger image of this Armenian wooden door with cross and stylized wings, and a royal hunt scene with a leopard behind the king, probably from Cilicia, 12th or 13th century. More to the point is the integration of the pair of wings into the Christian iconography of Armenia, the first state—before Rome—to officially embrace Christianity. The Armenians depict their Holy Cross with a pair of stylized wings underneath (fig. 163) and refer to it as P`ark` Khch` (“Glorious Cross”). Because p`ark` is the Armenian equivalent of the Persian Farr and derives from a common root,216 we can only conclude that the wings were added to the cross as a substitute for the word Glorious.217 Since the Armenian kingdom was an offshoot of the Parthian’s, its regal iconography generally mirrored the Persian one. Thus, in a 12th century wooden door from the Armenian kingdom of Cilicia (fig. 167b), we not only see the Cross with its pair of stylized winged underneath but also a hunting scene in which the king, as in Sasanian rock reliefs and silver plates (figs. 157, 166), is confronting a ferocious animal (a bear in this case) depicted twice: initially alive and then shot at. Moreover, on the back of the king’s horse sits a leopard. The leopard as well as the falcon were prized accessories of royal hunts in the Eastern kingdoms (e.g., fig. 167a) and, therefore, symbolized regal status. 216 The Armenian language is from the family of Indo-Iranian languages. 217 Soudavar 2003, pp. 22-23. Fig. 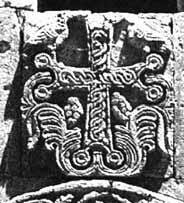 163 Armenian cross with stylized wings, from the Church of the Holy Cross. Aght`amar, Turkey. Fig. 167b Detail of Armenian wooden door, probably from Cilicia, 13th century, Courtesy of Sam Fogg, London. and Nishapur Plate, MNAO, Rome, 10th century, with 3 riders with leopards on the horse's rump.